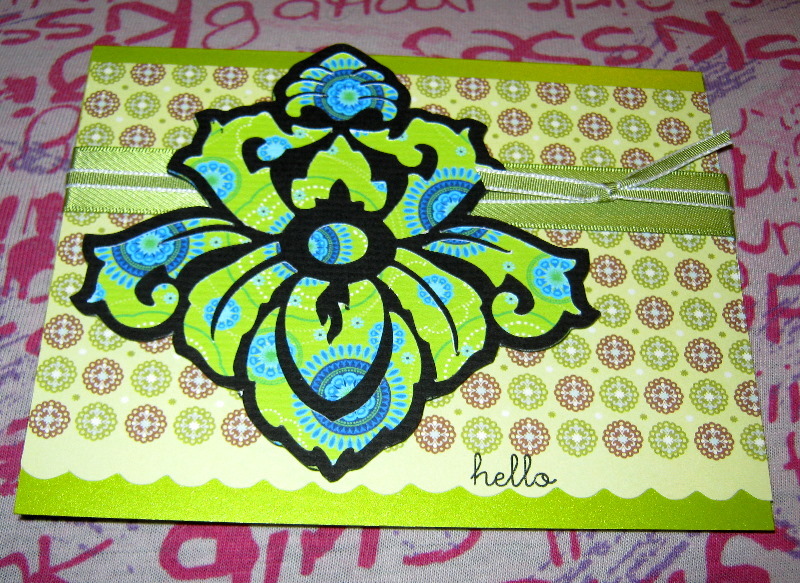 Posted on July 31, 2011 by Albert G.
Today’s card project is a hybrid of some artwork created with my Cricut Imagine and a newly acquired Martha Stewart Punch-Around-The-Page Combo Punch called Ribbon Loop. 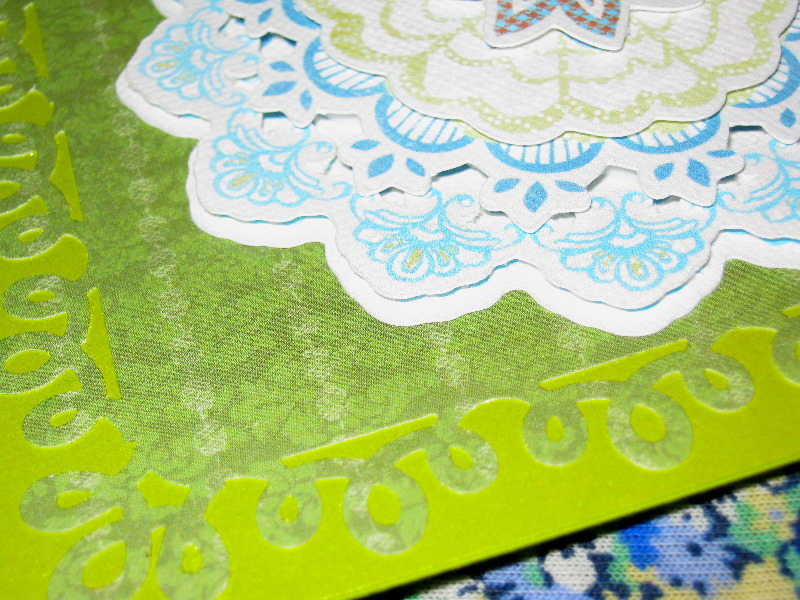 Using my Cricut Imagine and the “Lori’s Garden” art cartridge, I cut this kaleidoscope inspired layered image (pg. 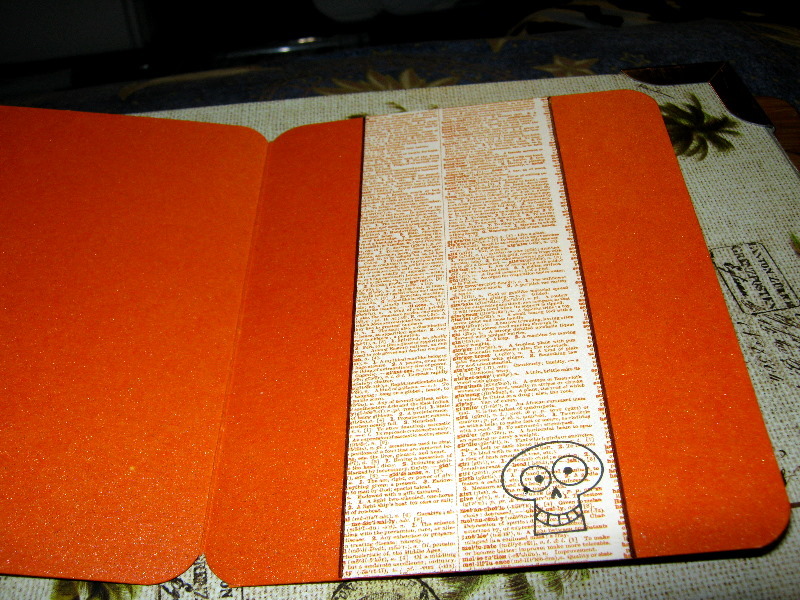 18 of the handbook) at 4″. 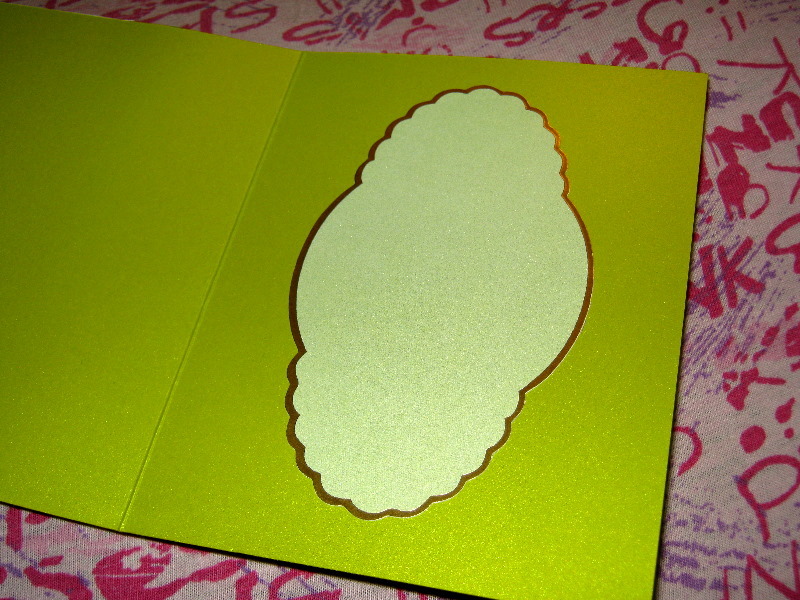 The image consists of five separate layers that I printed and cut on Bazzill textured white cardstock. 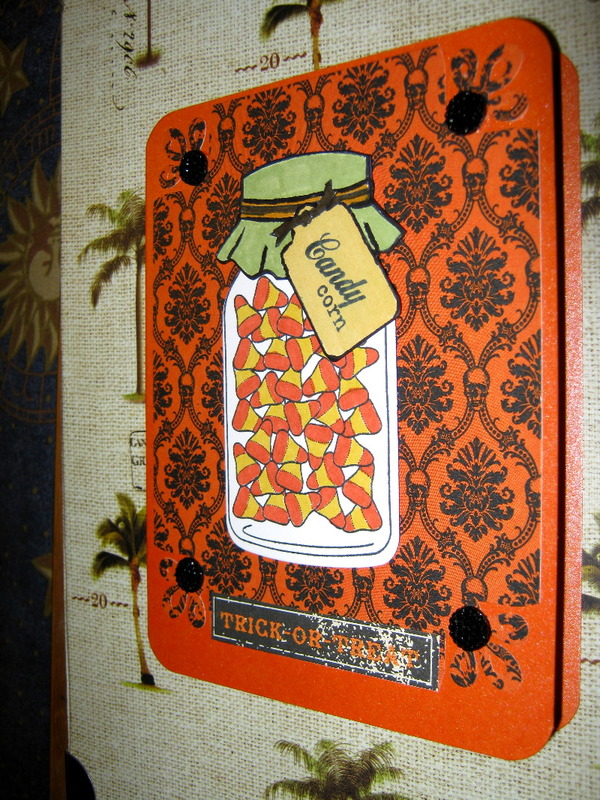 I used Stampin’ Dimensionals to attach each layer to provide a bit of depth and visual interest to the dimensional effect. 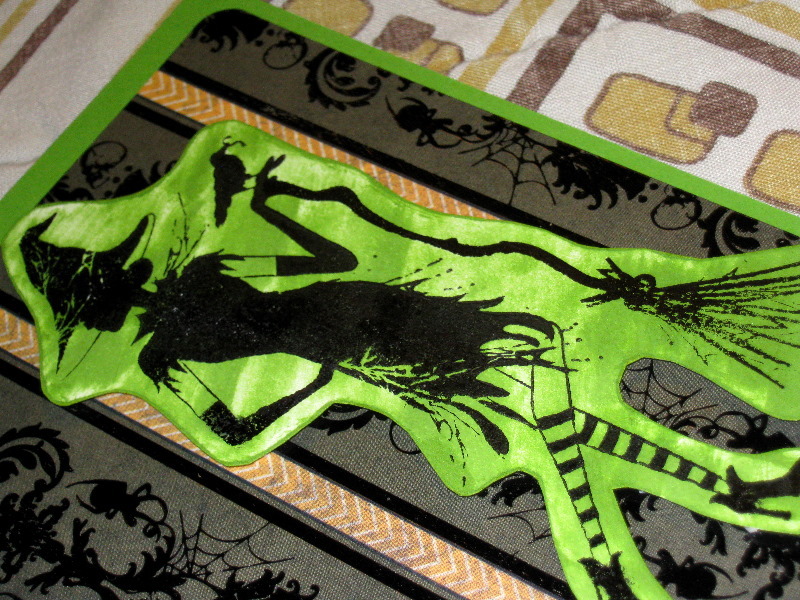 The card base is a piece of Stardream So Silk! 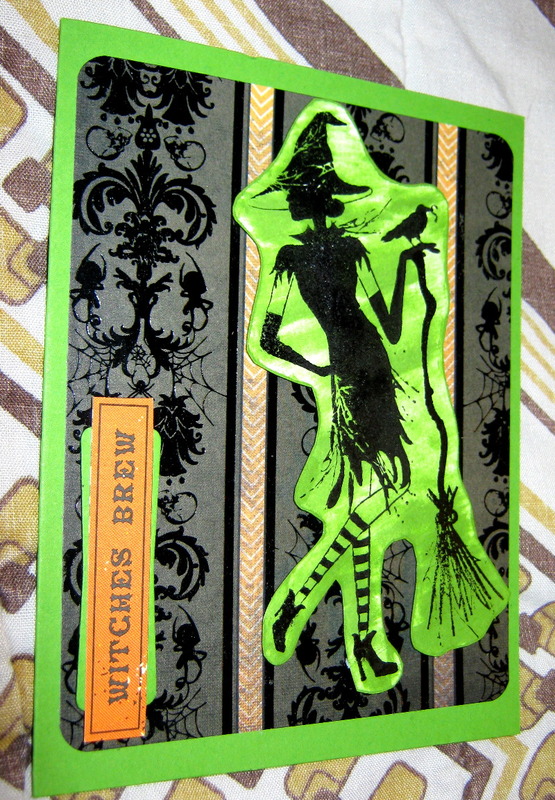 mica cardstock in Shocking Green. 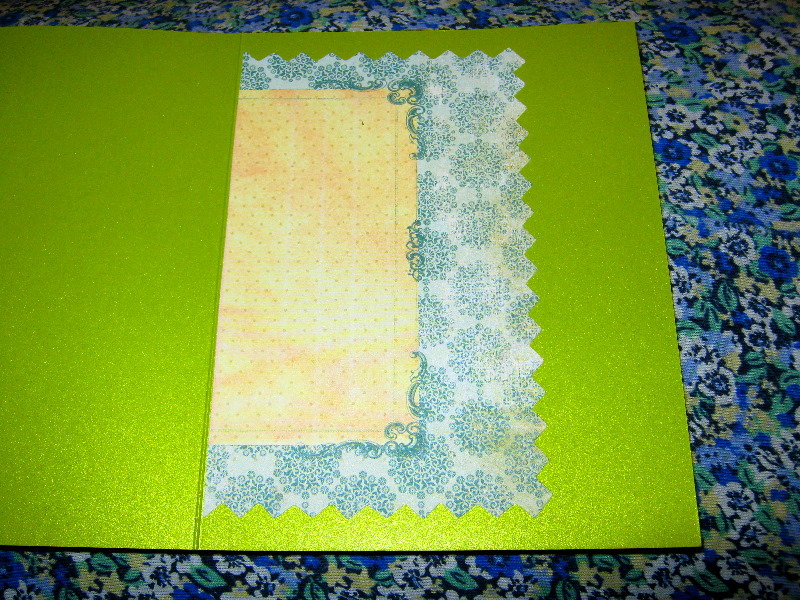 The mat is a 5″ x 5″ piece of Memory Box decorative paper from the “Minuet” collection. 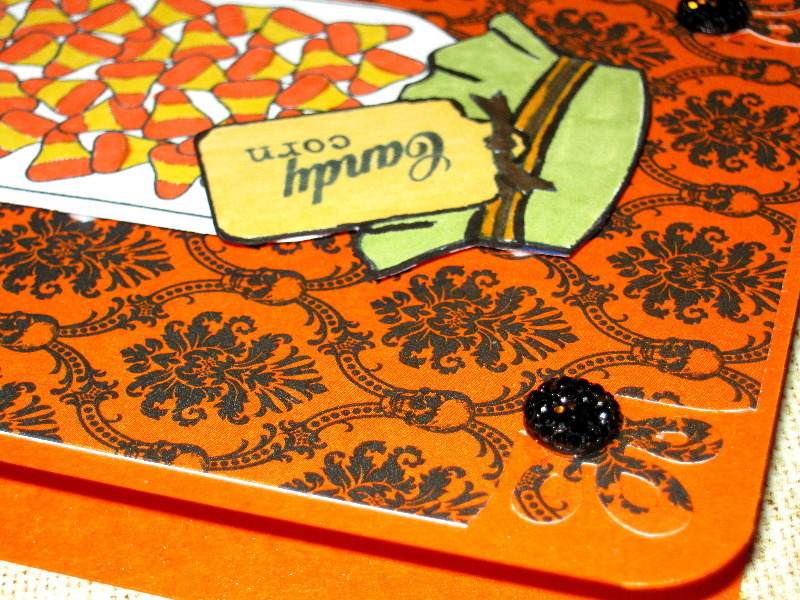 I then used the Martha Stewart punch set on the edges. 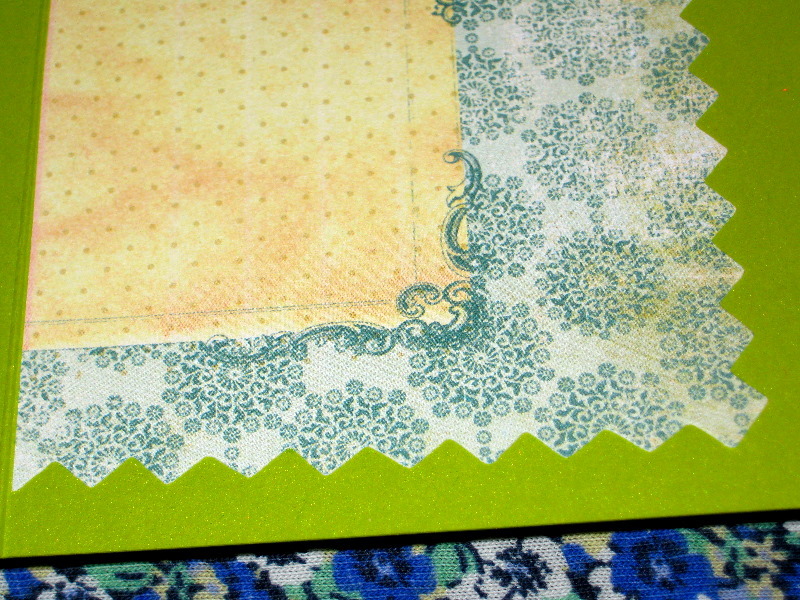 There was a similar Martha Stewart edge punch that did a loop look; However, I really like the offset look of this PATP set. 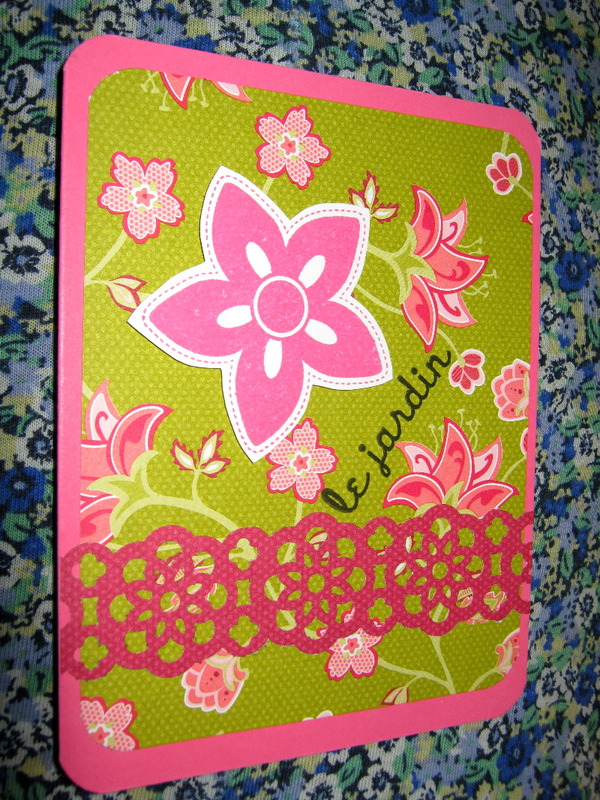 For the inside journaling block, I used a piece of Fancy Pants decorative paper and cut a zig-zag edging to three sides. 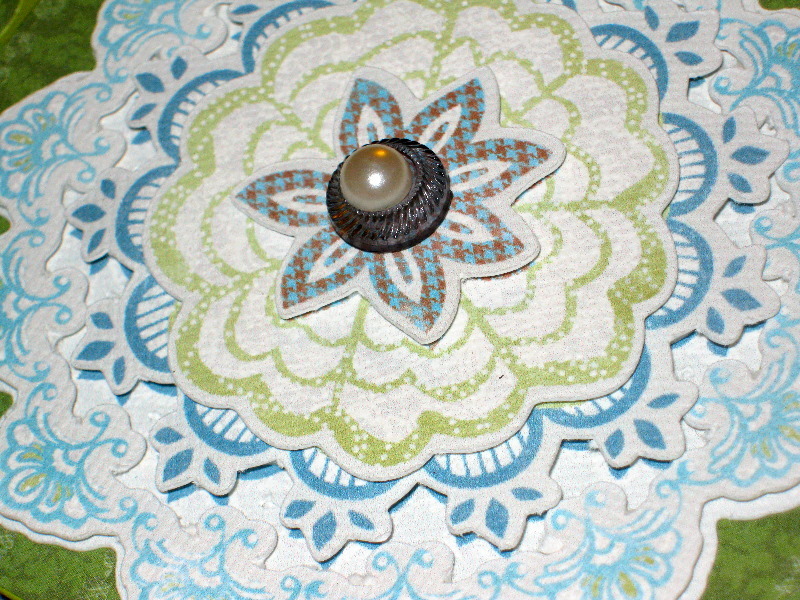 The final addition was an acrylic and pearl button from Webster’s Pages to accentuate the center of the kaleidoscope pattern. 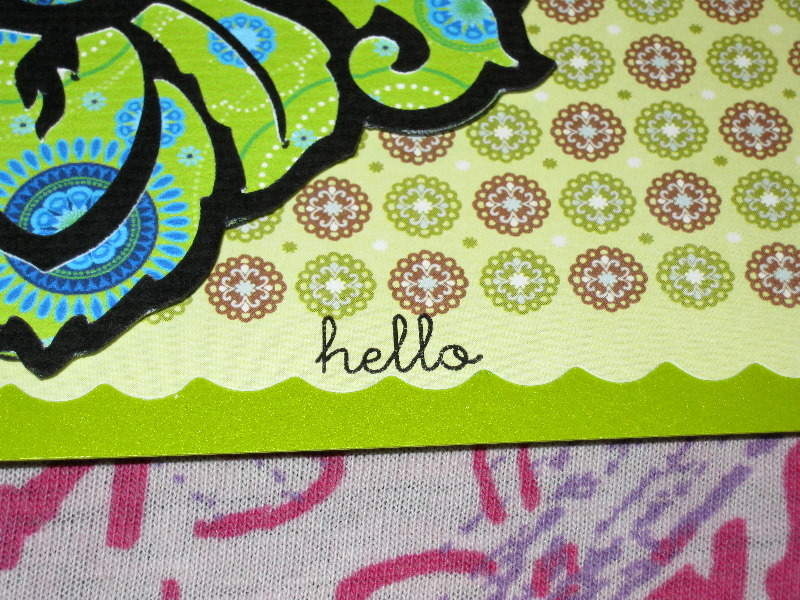 I purposely left off any type of sentiment, as I thought this would make a nice general purpose/stationery type card. 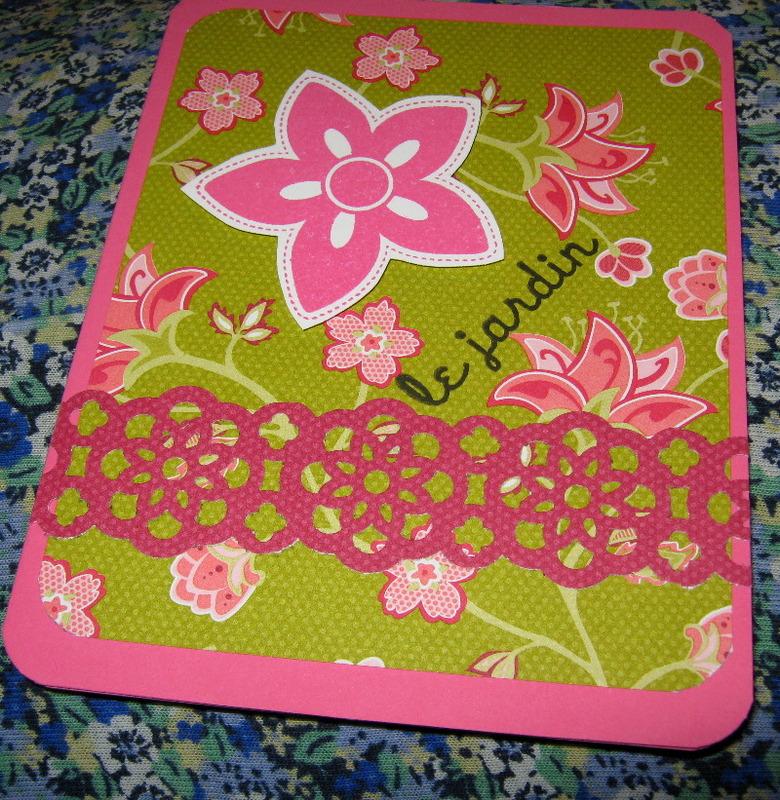 Posted on July 27, 2011 by Albert G.
Today’s card was born out of a strip of punched paper. 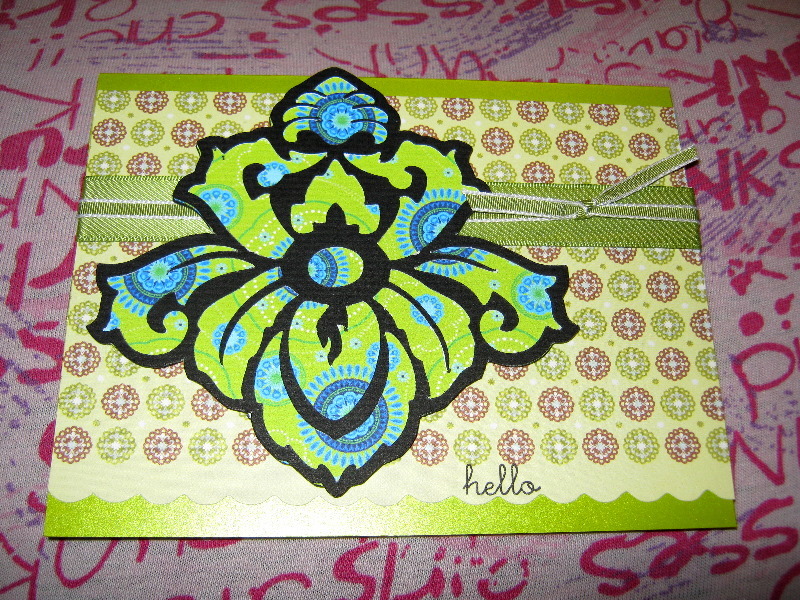 I’d been chomping at the bit to try a Stampin’ Up! 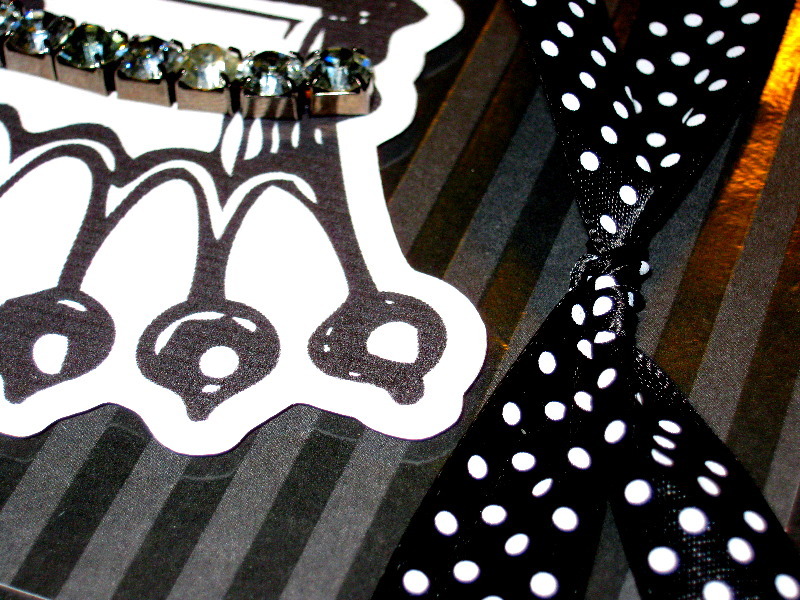 punch that makes its debut in the new 2011-2012 Idea Book & Catalog. 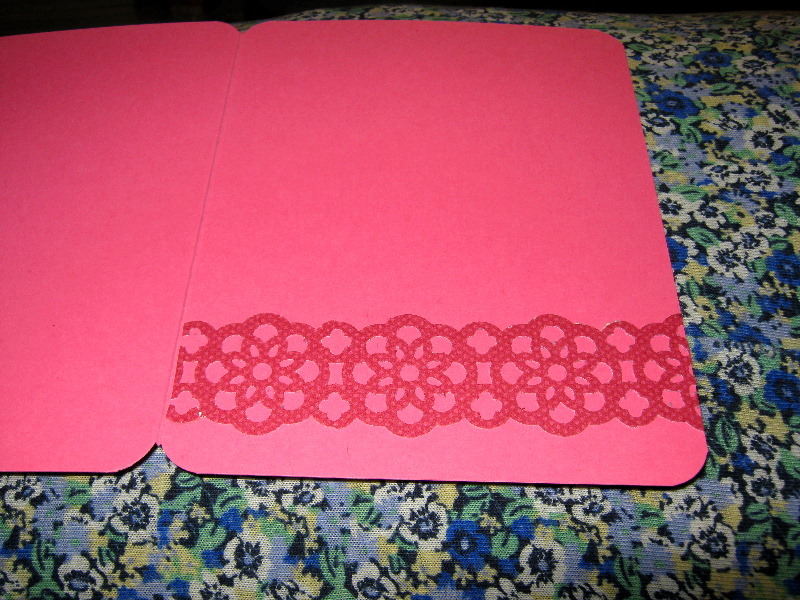 It’s called the “Large Lace Ribbon Border Punch” (#122362, $ 19.95). 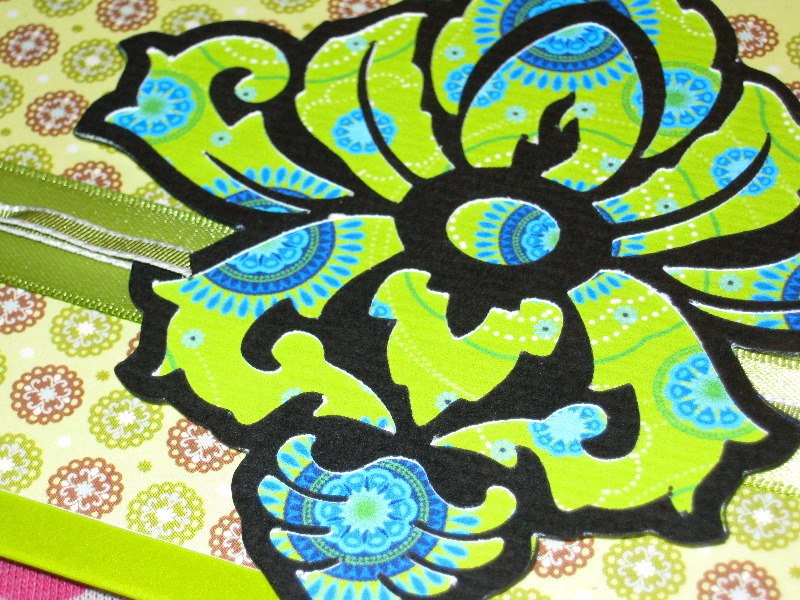 It’s a very versatile design that can be incorporated into your crafting projects in very different ways. 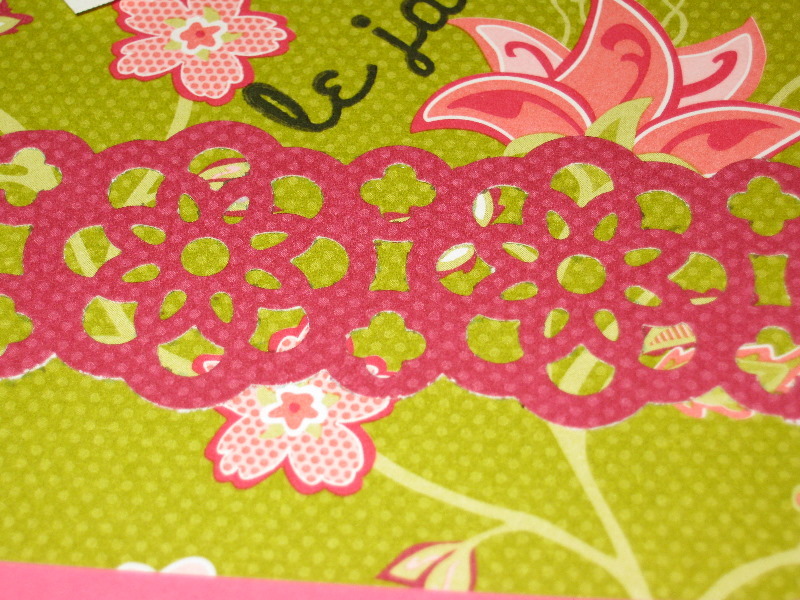 In this particular case, I chose to use it as an alternative to ribbon on the card front and as a decorative element in the inside of the card. 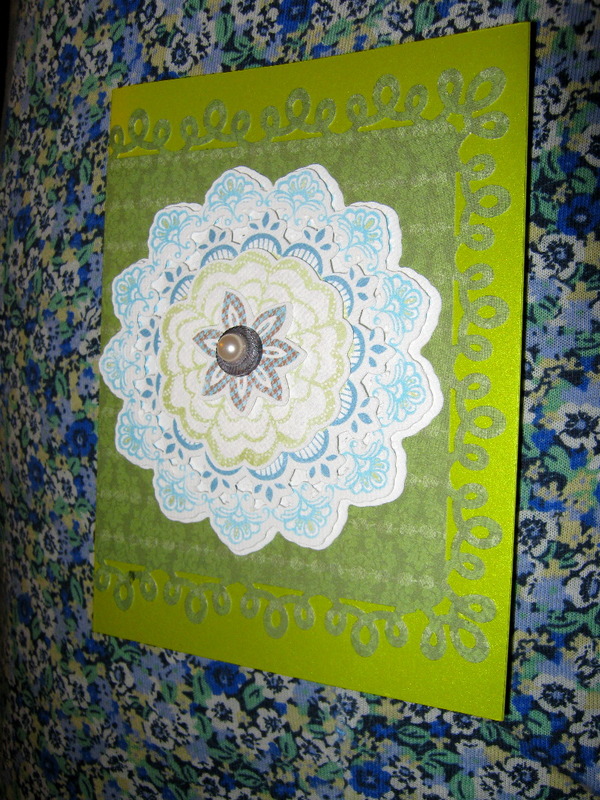 The card base is done in Papertrey Ink’s “Hibiscus Burst” cardstock. 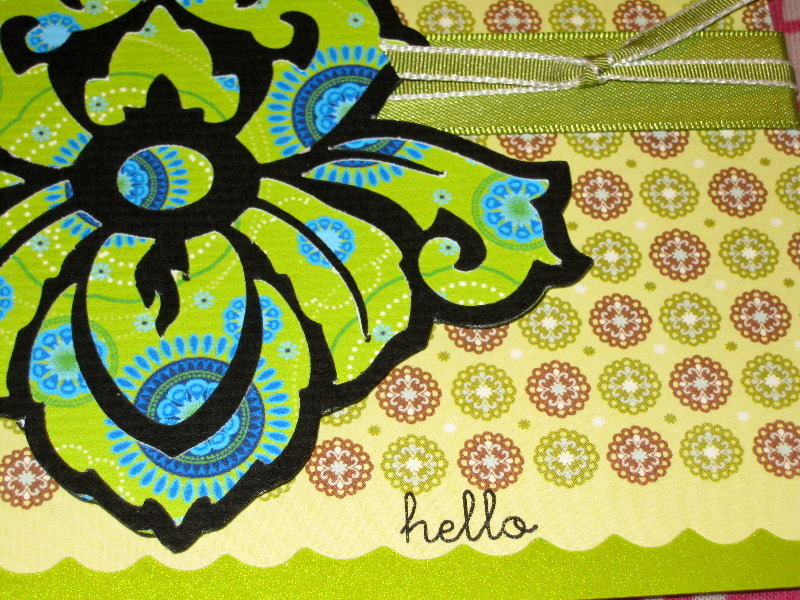 The decorative paper is a piece of Stampin’ Up! 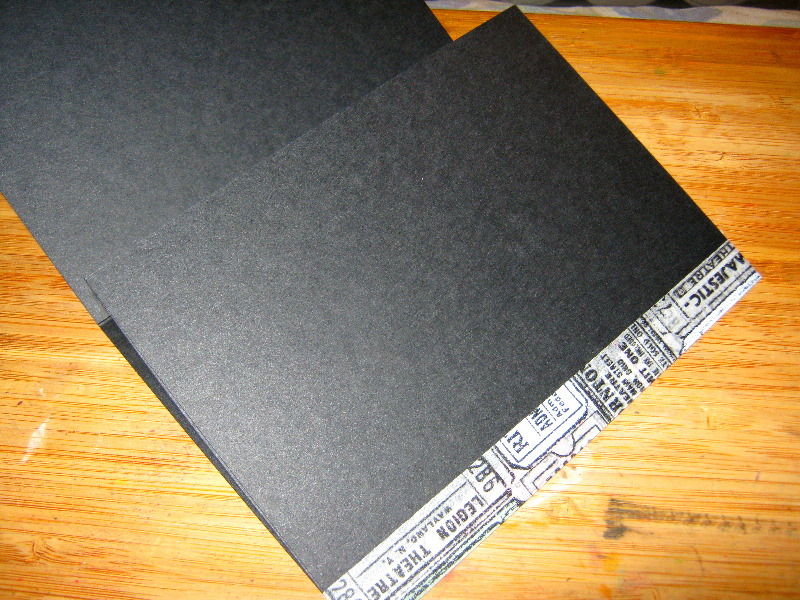 Designer Series Paper that is now unfortunately retired. 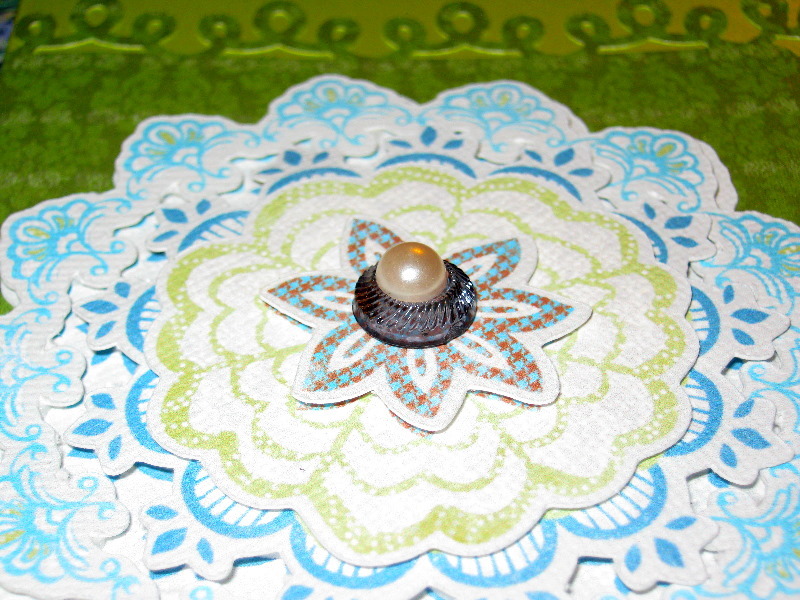 The focal floral piece is from a retired Stampin’ Up! 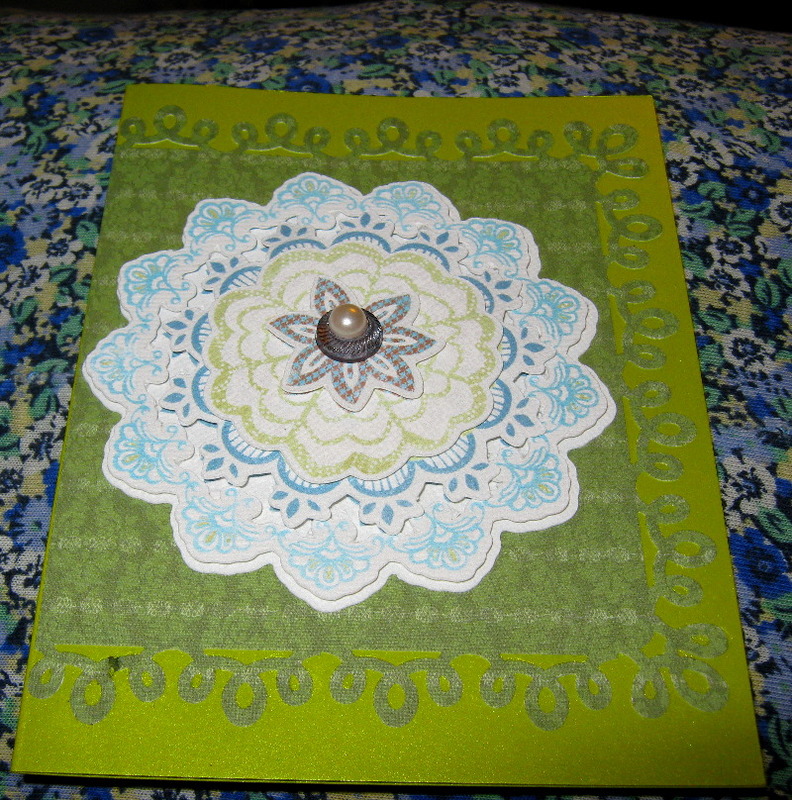 set called “Stitched Exotics” and is attached with Stampin’ Dimensionals. 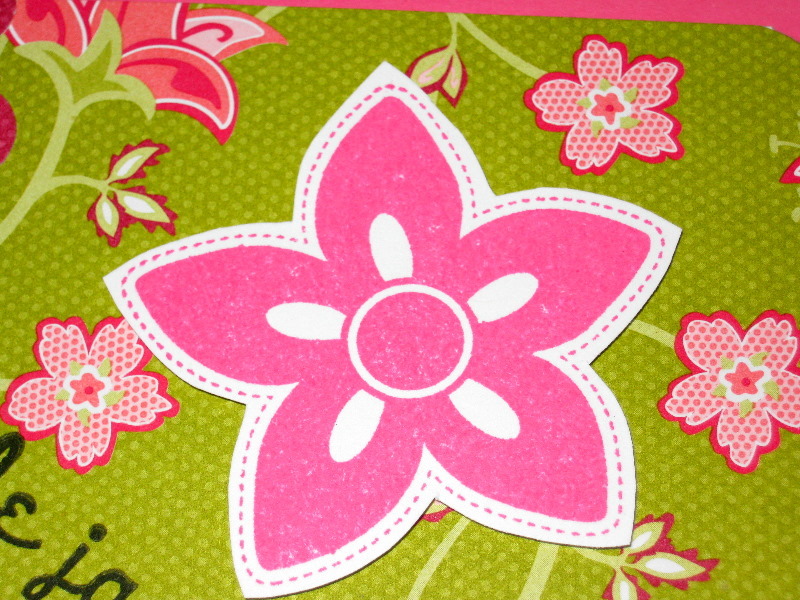 The greeting stamp is from Pink Paislee’s “Butterfly Garden” collection. 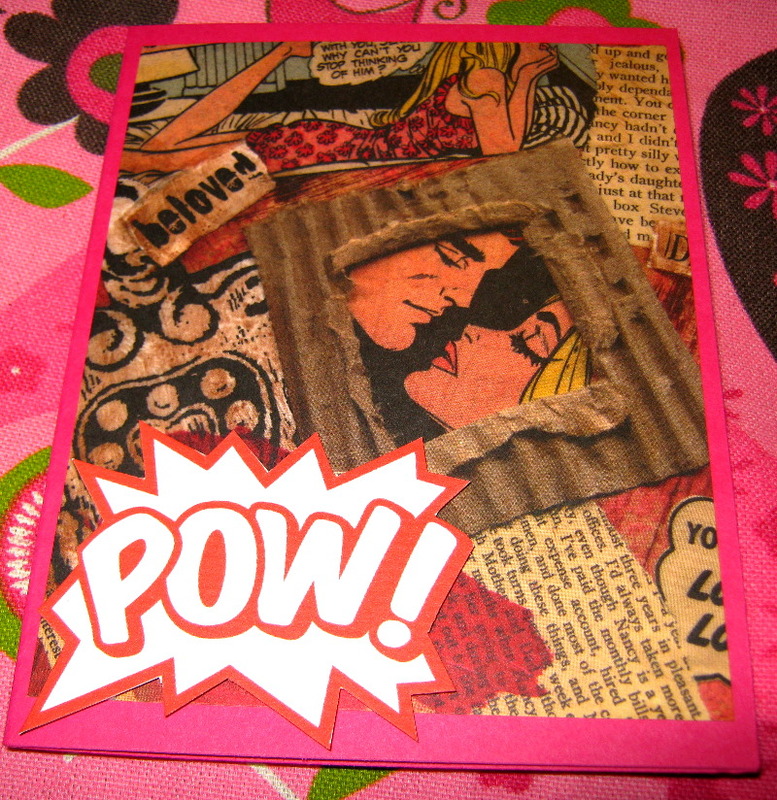 Posted on July 13, 2011 by Albert G.
Continuing with the comic book/collage theme, this card features a sentiment made with my Cricut Imagine and the new Cricut Projects cartridge called “Word Collage”. This cartridge is a really wonderful addition to the collection and spotlights the growing trend of “subway art” in crafting. While many will find this cartridge perfect for vinyl and home decor projects, Imagine users will find this one especially intriguing using the “print only” feature of the Cricut Imagine. 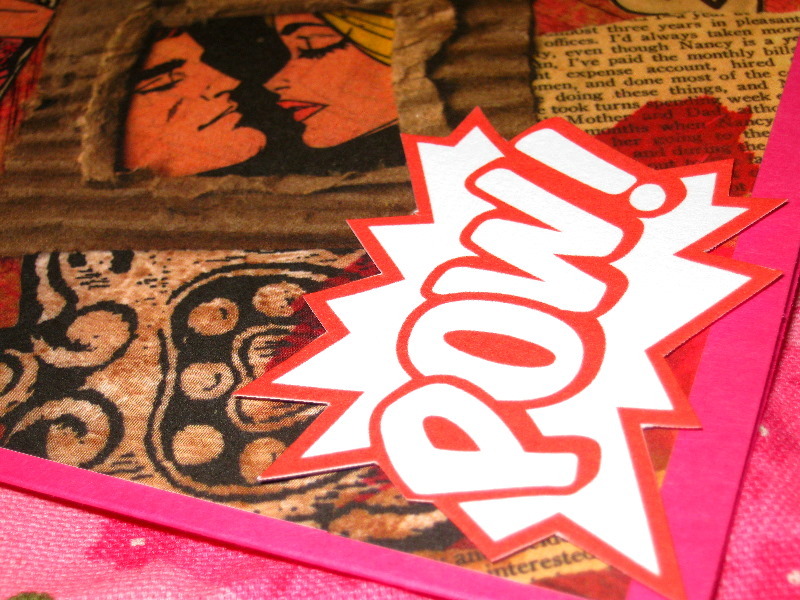 This sentiment (“POW!”) is part of a panel featuring comic book related sound effects. 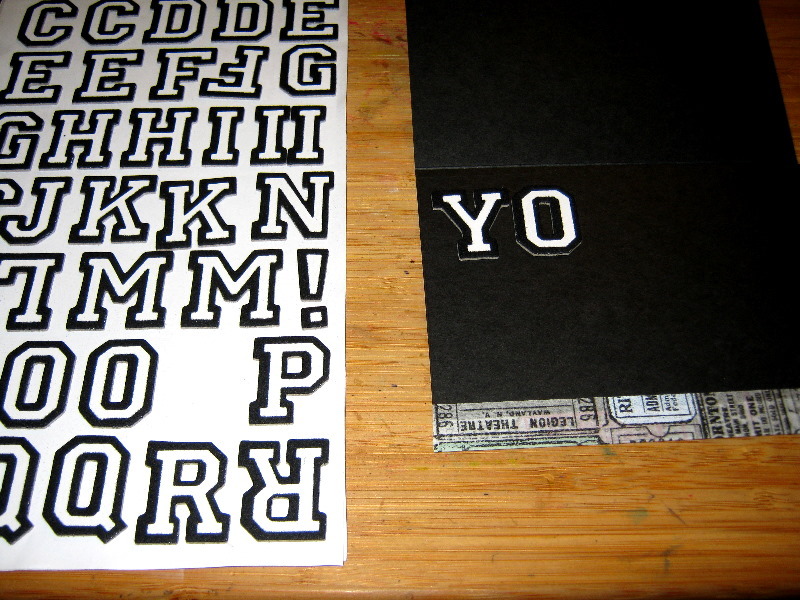 I simply printed it to the size I wanted and then cut it out with scissors. 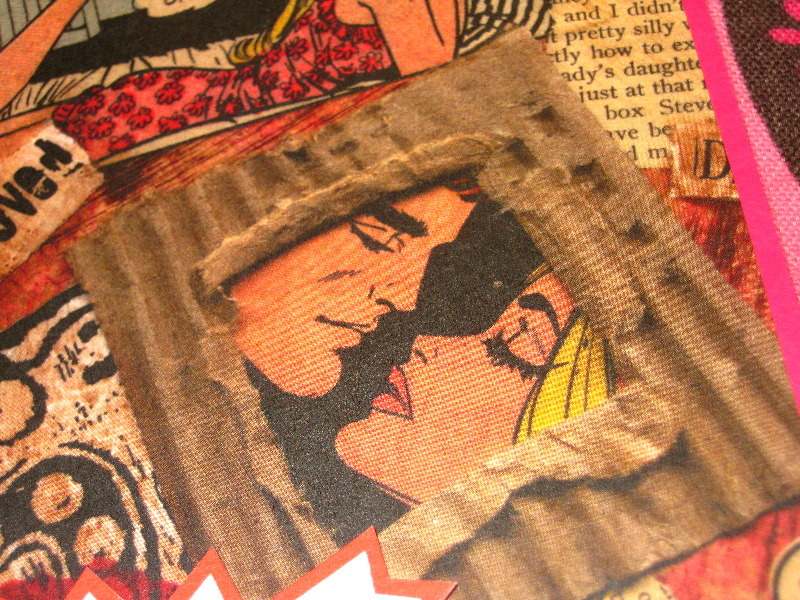 It seemed to be the perfect match for the romance collage background. 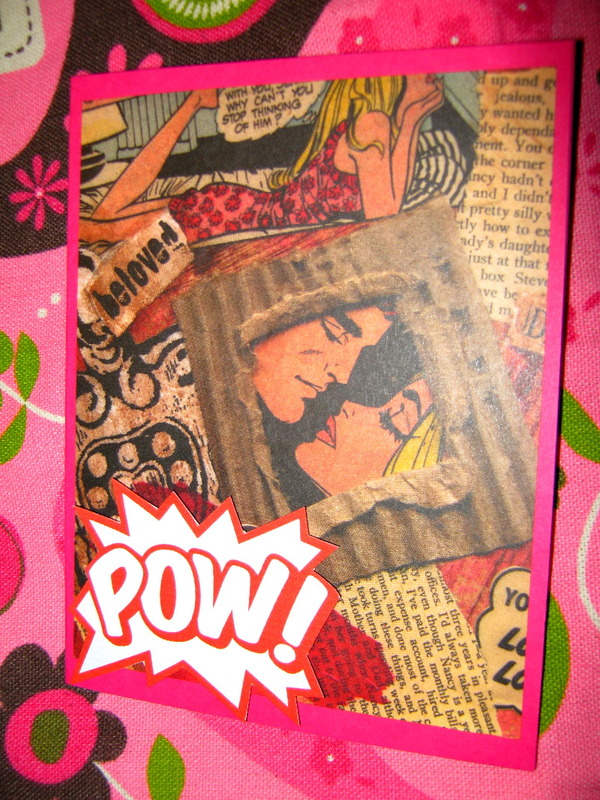 I also like the play on the fact that love sneaks up on you…and “POW!”. My recommendation is to definitely add “Word Collage” to your wish list (if you haven’t already added it to your exploding collection). Posted on June 13, 2011 by Albert G.
Sometimes the road to a completed card project is a happy accident. 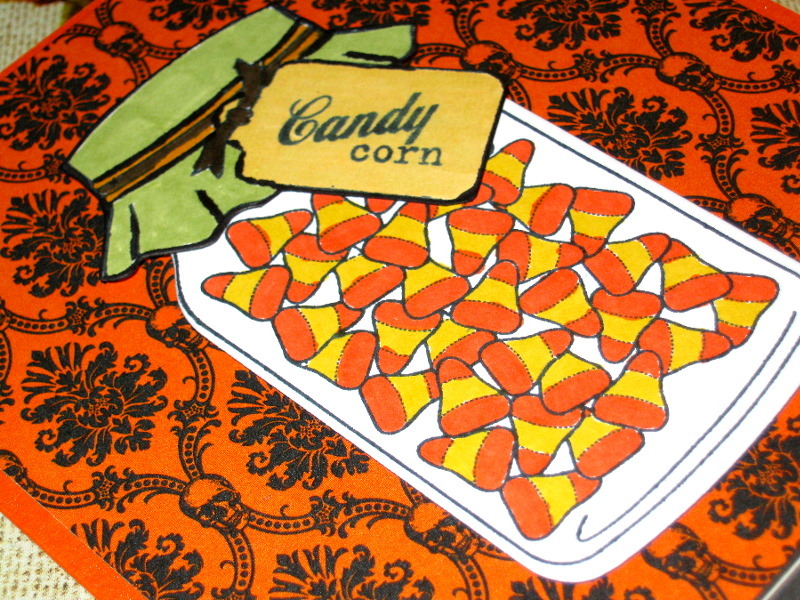 Most times, I really don’t “plan” ahead when I’m going to create a card. 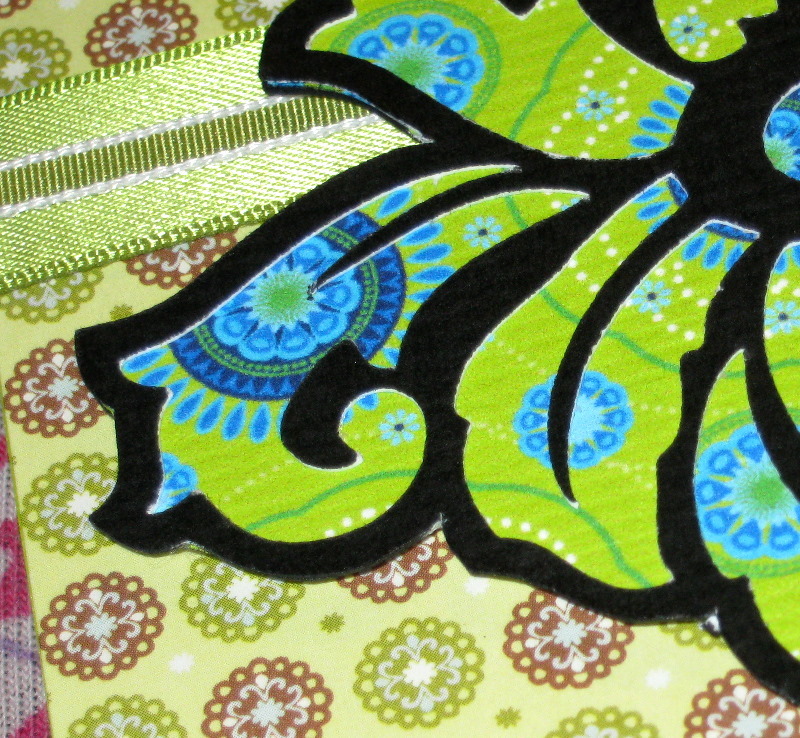 I’m more of a “go with the flow” kind of crafter. 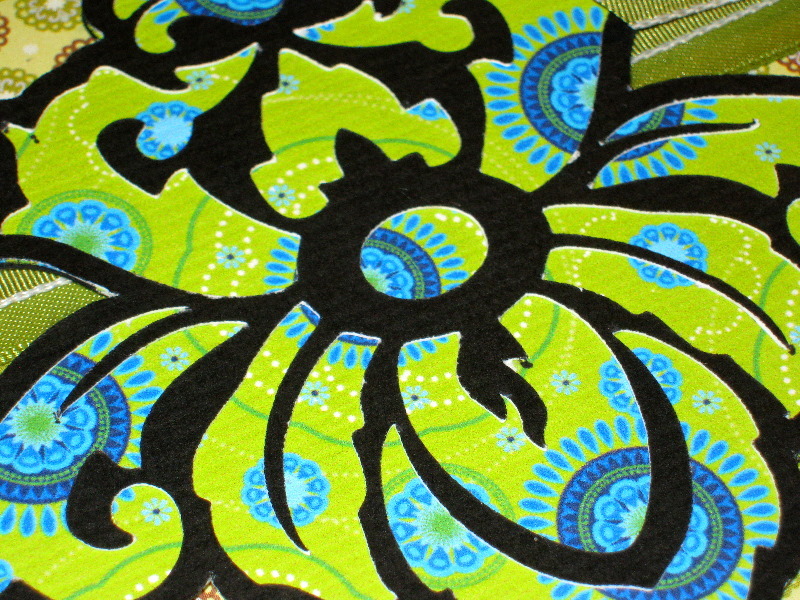 I usually just try different combinations of materials and embellishments to see what looks good (to my eye) and experiment with colors until I find some combination that “works”. Even then, many times I’m not sure what event or recipient I have in mind until I’m done. So thinking of this crown image, I knew I had some great caviar cup-set crystals that would look fantastic on it…and I liked the sentiment “You Rule!” to go along with it. 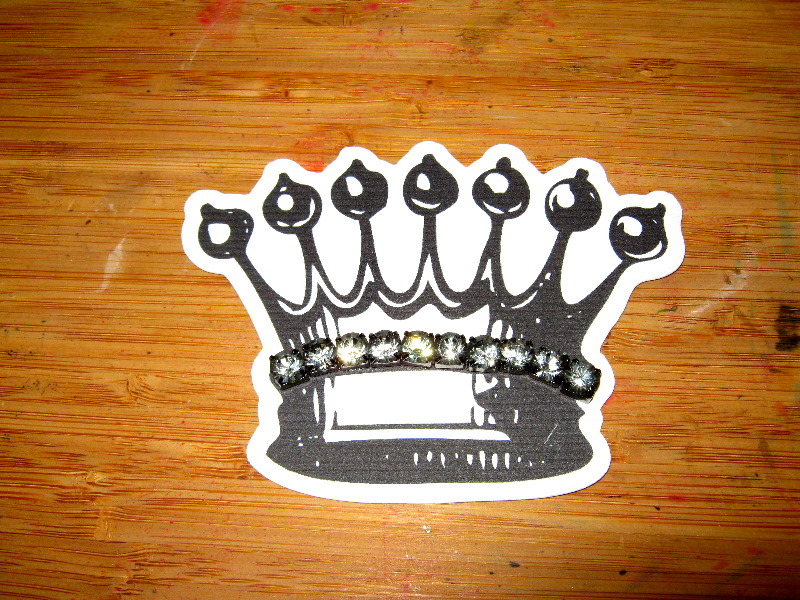 The problem was that I wanted the crown to be rather large; I cut it a 4″. 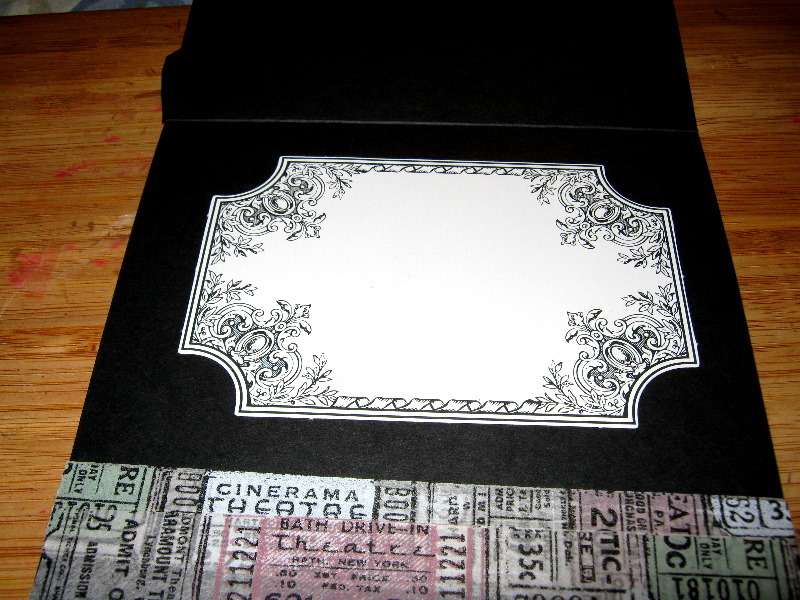 When my mind’s eye saw this black and white creation coming together, I remembered I had some American Crafts Thickers chipboard alphabet stickers that might look good on this card. 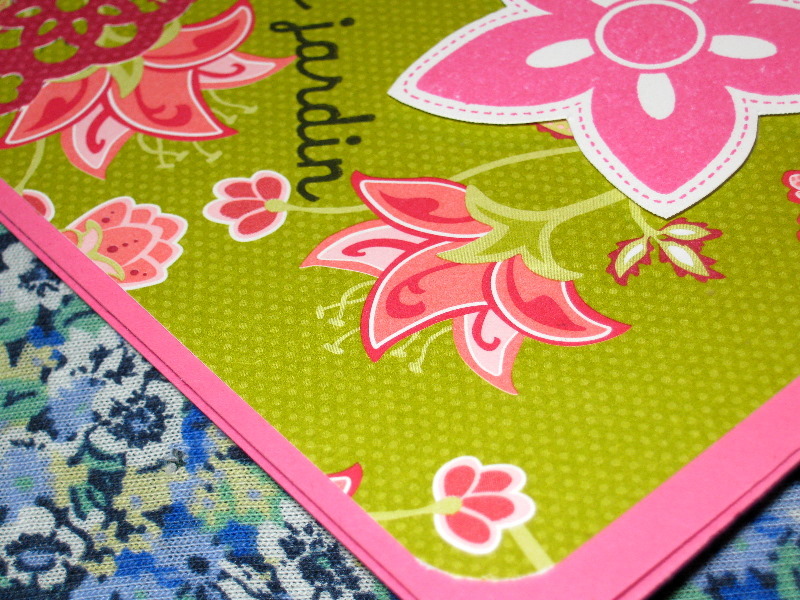 But it quickly became apparent that everything was not going to fit on my standard A2 card format. That’s when it was time to think outside the box. 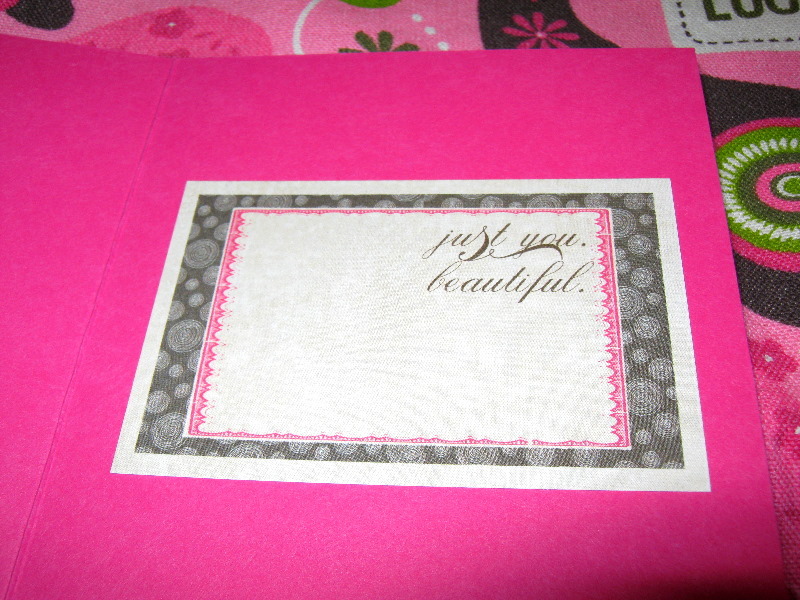 I started the card with a 5 1/2″ x 8 1/2″ piece of black cardstock scored at 4 1/4″. After trying to arrange my card front elements, I soon realized I needed to expand my surface area and still keep with the design aesthetic I was going for. 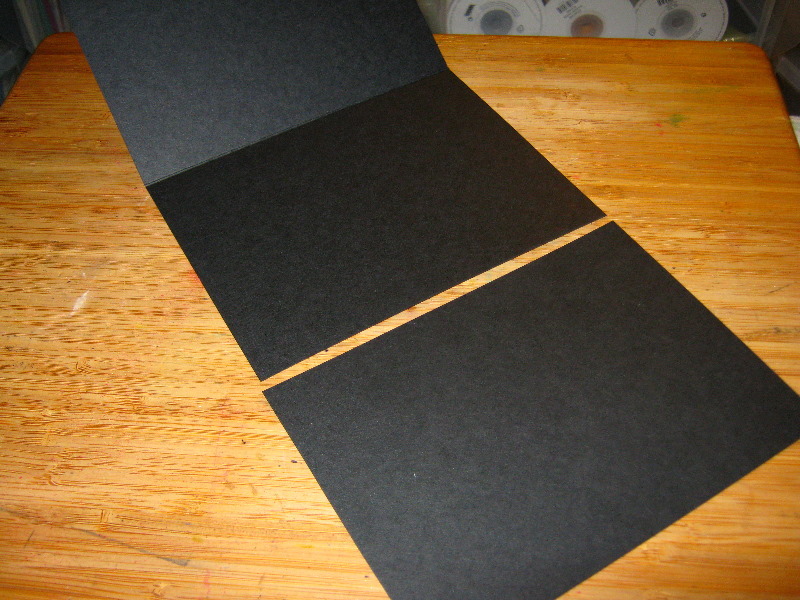 So I cut another piece of black cardstock at 5 1/2″ x 4″. 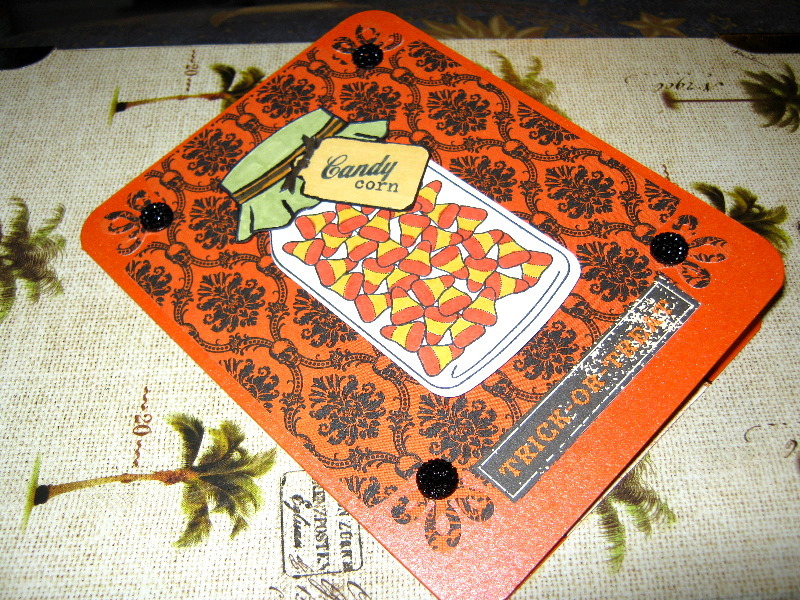 Now the trick was figuring out how to adhere it to my card base and still have it be functional in the design. But first, let’s take a look at the crown art. I used my Cricut Imagine to cut and print the crown. 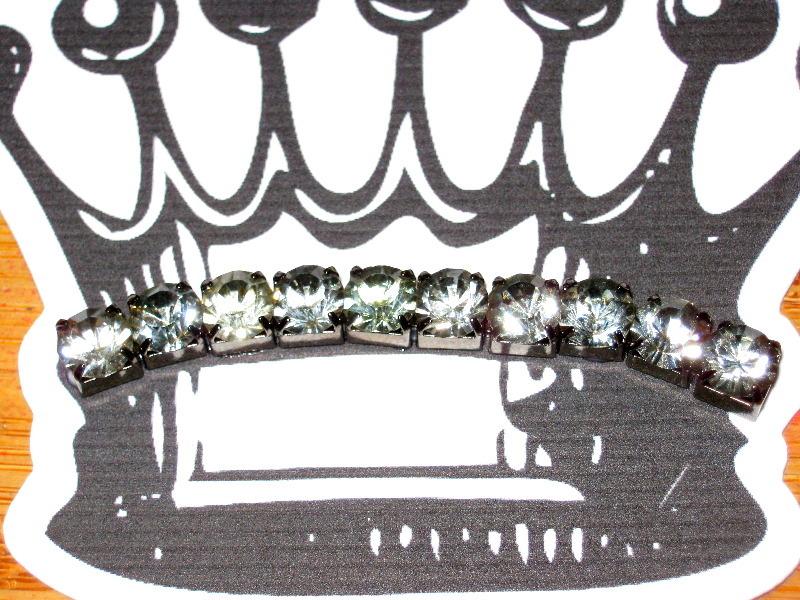 I then used some liquid adhesive to attach my fairly large caviar crystals along the banding of the crown. 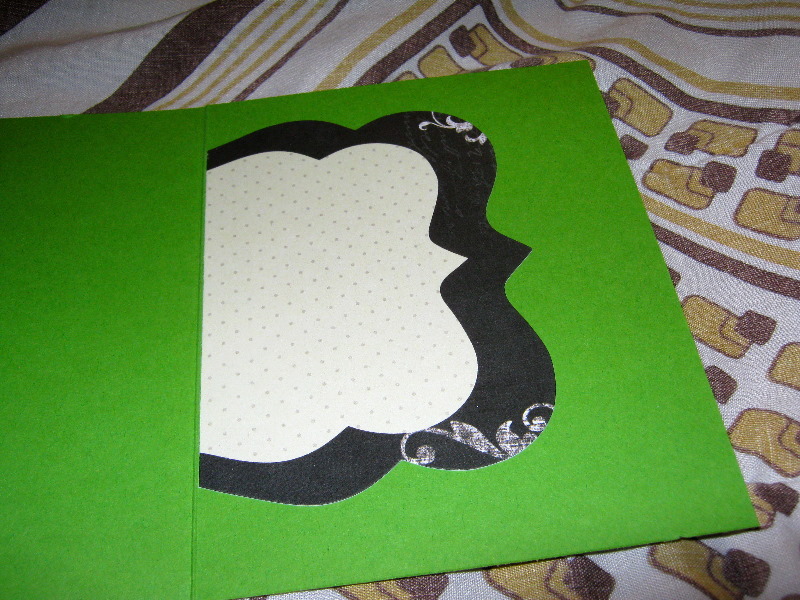 The rest of the card front came together easily. 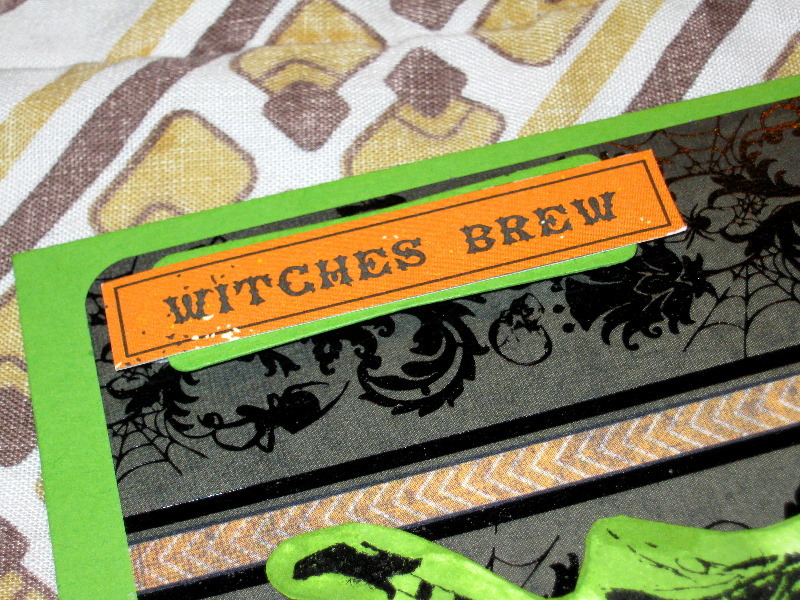 I used a piece of Stampin’ Up! 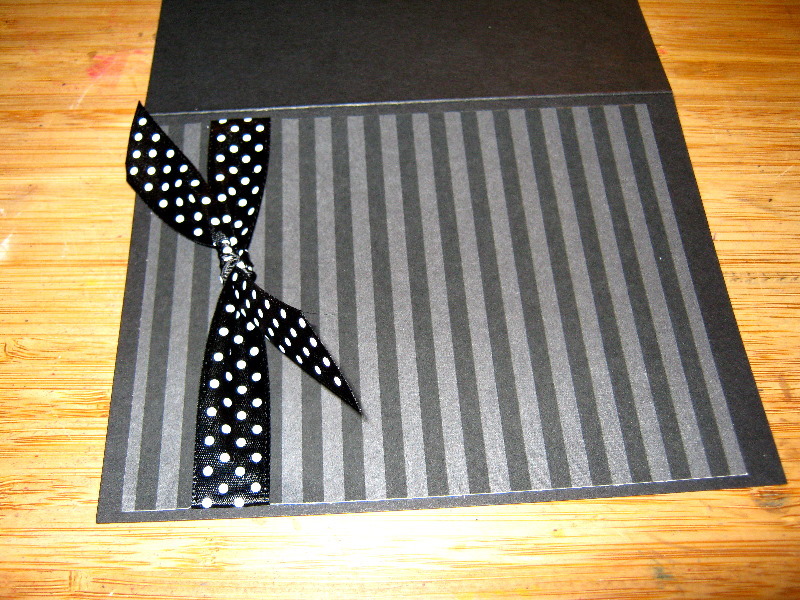 Designer Series decorative paper that had a varnished stripe pattern as my card mat (4″ x 5″). 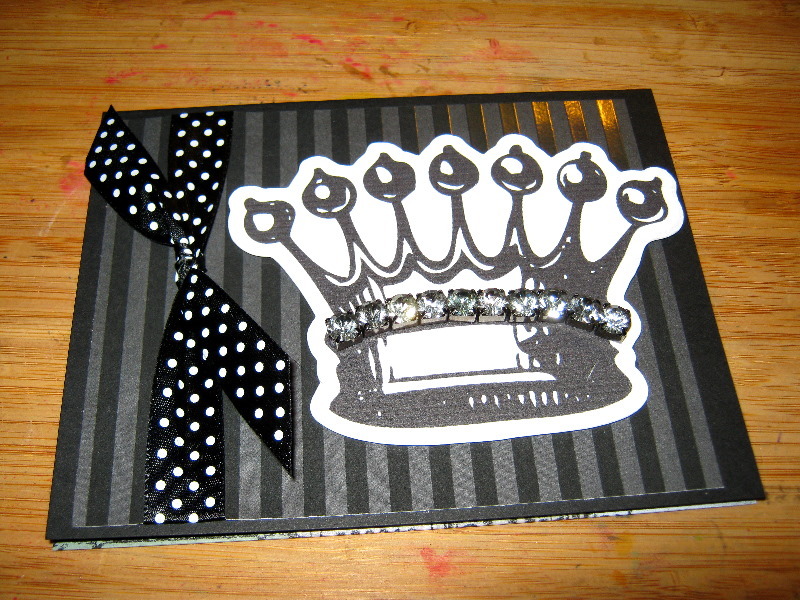 A piece of Papertrey Ink polka dot ribbon and some Stampin’ Dimensionals to attach my crown and it was coming together. 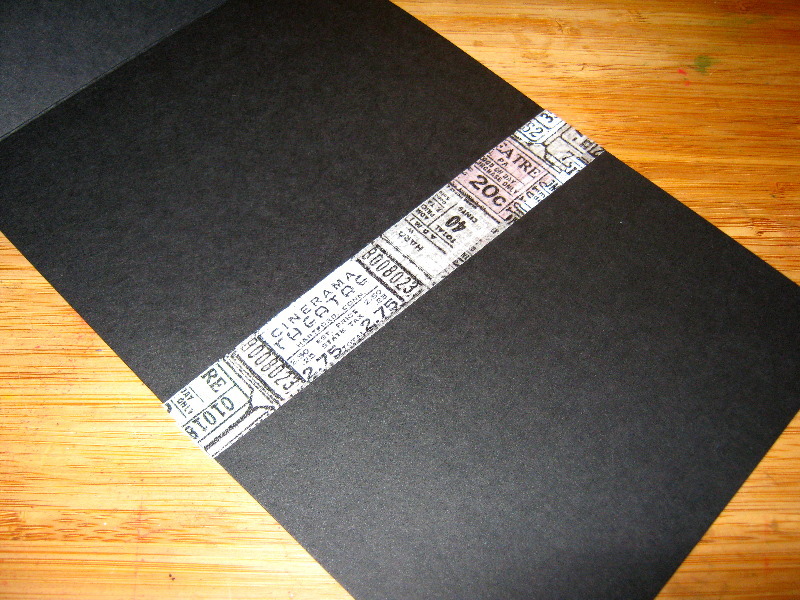 The solution to my “flap” problem came by using one of my favorite things–tissue tape. 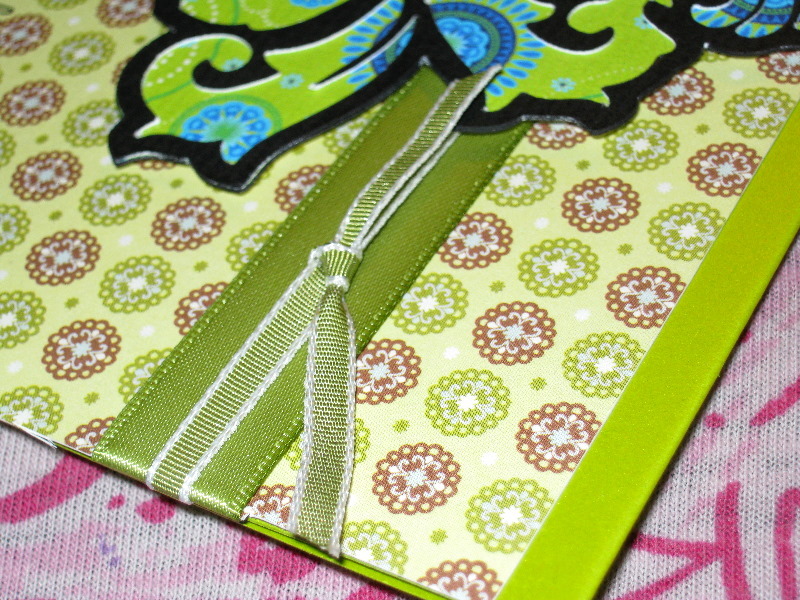 Using some Tim Holtz ticket patterned tissue tape, I attached the extra flap of cardstock with strips on the top and bottom of the splice where the flap met the card base. I love this option because the tissue tape has a nice “give” to it and is flexible enough to withstand repeated opening and closing without being overly bulky or intrusive. 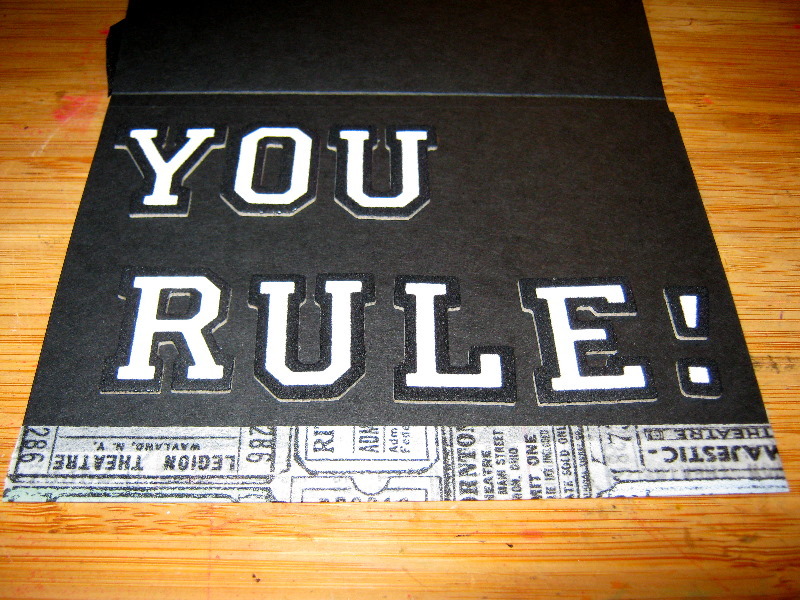 Using the aforementioned Thickers (in a flocked Varsity style), I put my sentiment on the added flap. 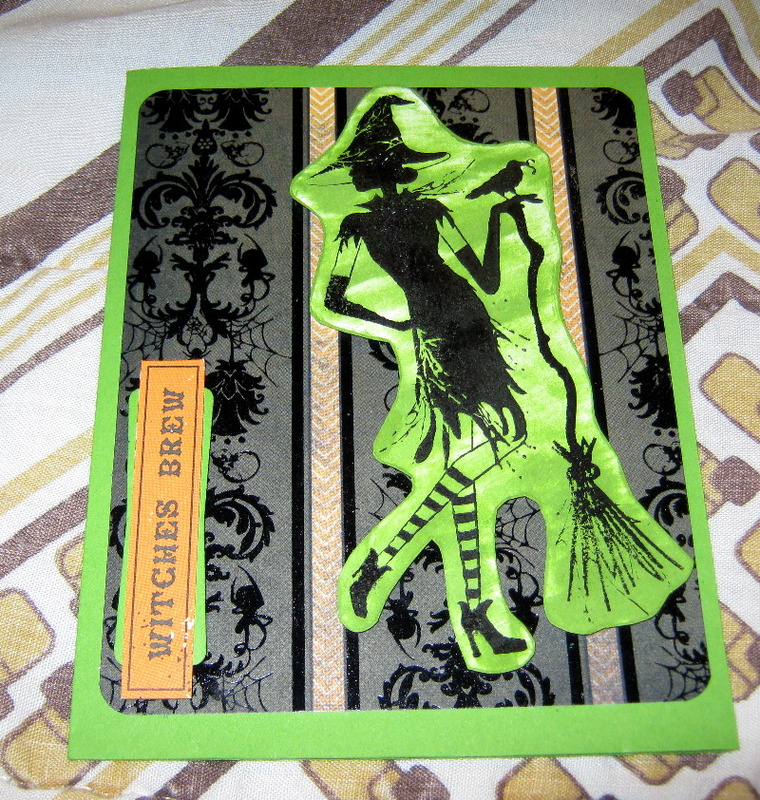 Finally, another piece of Teresa Collins artwork in the form of a journaling block completes the inside of the card. The moral of the story? 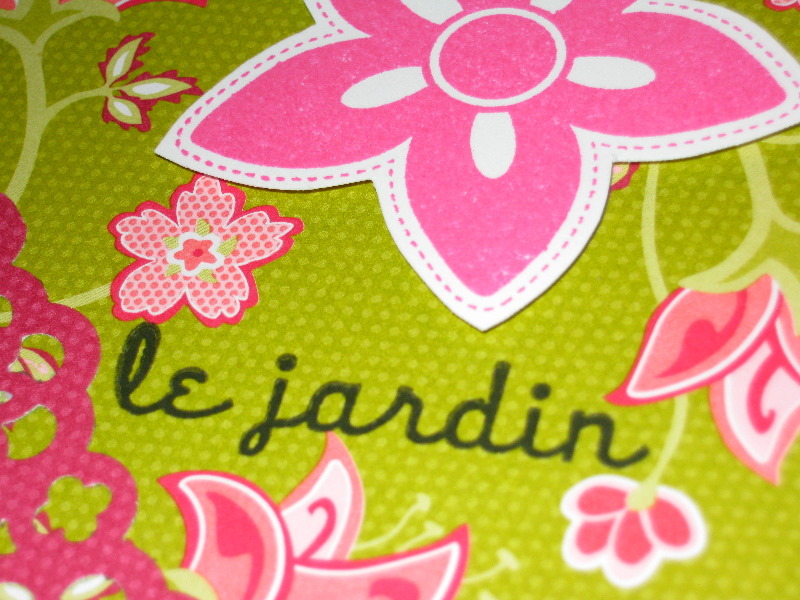 Don’t let your materials (or your preconceived notions) box you in. Let your creative mind run rampant and find a way to work to bring what you see in your mind to fruition with your hands. Posted on May 19, 2011 by Albert G.